When the rock super group The Winery Dogs released its self-titled debut record two years ago, few if any knew whether or not it would be the trio’s only release. So when it was announced in 2014 that the band—Richi Kotzen (guitar, vocals), Billy Sheehan (bass), and Mike Portnoy (drums)—had started work on a second album excitement instantly built among both the band’s fans and fans of the band’s members. Now with the release of that album—Hot Streak—earlier in October it can be said that it has definitely lived up to its expectations. The thirteen-song record boasts elements of each of the artists’ own musical influences past and present; elements that combine to make it a record that is anything but the sophomore slump. This is clear right from the album’s opener, the up-tempo rocker ‘Oblivion.’ Fans of Portnoy’s work with Liquid Tension Experiment will note the clear similarities to that band’s sound in regards to its musical content. It is just as intriguing in terms of its lyrical content. Both elements combined make ‘Oblivion’ a solid opener for Hot Streak and an equally solid re-introduction for the band, too. ‘The Bridge,’ which comes later in the album’s run, is another good example of how much Hot Streak has to offer fans. In regards to its musical content, it is pure prog rock akin to material crafted by King’s X. Speaking in terms of its lyrical content it is just as interesting. It comes across in its verses as a commentary of sorts. The chorus creates thoughts of a love song. Regardless of whether it is one, the other, or possibly even neither, the fact that the lyrical content can spark such thought and discussion makes it all the more interesting of an addition to this record. ‘Fire,’ the album’s mid-point as it were, is one more great addition to this record. It is the polar opposite of all of the album’s other up-tempo rock songs. This is the case at least in regards to its musical content. Its lyrical content is another story. Its lyrics present a deeply moving, introspective story that will impress listeners just as much as any of the album’s other, more upbeat compositions. Whether for these songs or for any of the others not directly noted here, it can be said of all thirteen songs that together, they make Hot Streak a record that is plain and simple, one of the best of this year’s new rock albums. The Winery Dogs’ sophomore album Hot Streak is a solid follow-up to its self-titled 2013 album. It is also one of the best of this year’s new rock albums. That is clear right from the album’s opener ‘Oblivion.’ This song is a great first impression for the band in its new album and an equally great re-introduction for the band, too. Considering the song’s lyrical content one would think this would be a rather slow, moody song. It proves to be anything but. In fact those that are familiar with the music crafted by Liquid Tension Experiment will instantly find quite the striking similarity between the two bands here. Interestingly enough, that sound is a good fit for this song in examining the song’s lyrical content. The song’s lead verse reads, “It came to me in the middle of the darkest night/I don’t know if I was dreaming or I got too high/But my demons are closer/I’m flying blind/But my eyes are open wide/From the darkness to the light to the place I die/Wake me up when it’s over.” This is quite the deep thought. Taken into context with the song’s musical content, the two elements together paint an interesting picture. It is a picture of someone in a difficult emotional/mental state. It could be a momentary thing or something more. Regardless, the band has done an impressive job of telling the song’s story through the combination of its musical and lyrical content. 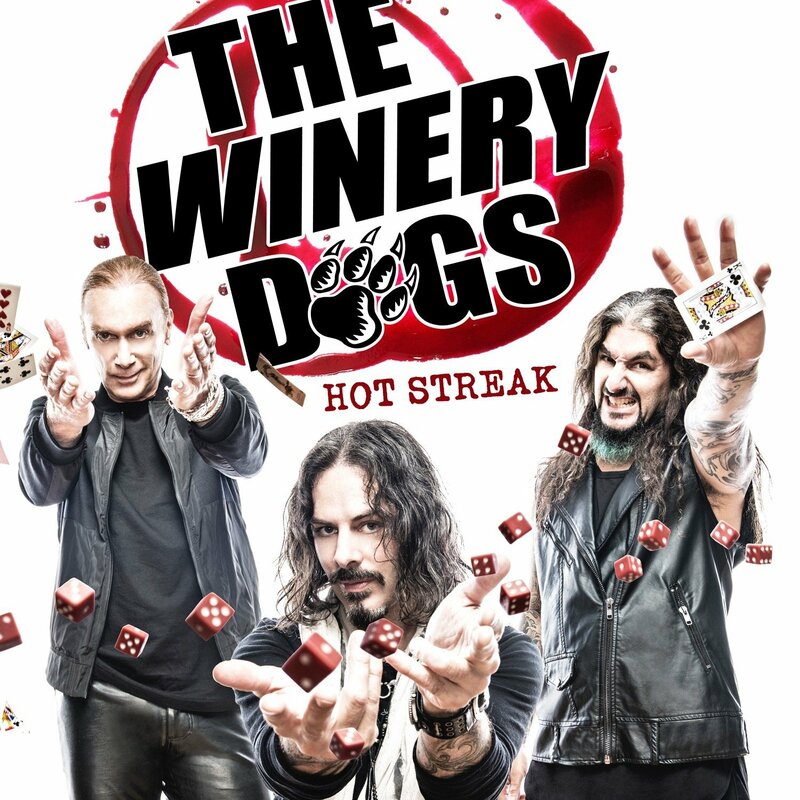 And it’s just one example of how Hot Streak proves to be a solid sophomore release for The Winery Dogs. ‘The Bridge’ is another example of the album’s strength. ‘Oblivion’ is a solid first effort for The Winery Dogs in the band’s new album Hot Streak. It is also a welcome re-introduction for the band in its new album. As impressive as it is in whole, it is just one example of Hot Streak’s strength. ‘The Bridge’ is another clear example of the album’s strength. The song’s musical content instantly conjures thoughts of King’s X thanks in large part to the work of all three musicians. In examining the song’s lyrical content it is just as interesting. That is because of the seeming duality of the lyrical content. Kotzen sings in the song’s lead verse, “Why do I feel like I know you/I know where you wanna go/I’ve got new things to show you/You’re prime/Don’t you wnana walk over water/From Morocco to Gibraltar/Let’s saunter/Rise we all stand before the altar/You oughtta know/I ain’t gonna let you falter/And when it’s time to die/We’re going right back where we started where we all did.” This verse alone feels very introspective. Yet the chorus presents a much different message. As Kotzen sings, “Sing to me your lullabies/Share all your secrets with me/I’ll bend to your heart’s desire/Step with me/Cross the bridge to the light/And see eternity in my eyes/And for eternity you will be mine.” On the one hand this comes across as something that would fit into a love song. On the other hand it could also be interpreted as someone beckoning his or her loved one to come over, perhaps as that perhaps is about to cross over. That may very well be a stretch. But the gentility in Kotzen’s vocal delivery coupled with the overall positive vibe of the song seems to hint that it could indeed be just that. It would make that lead verse make more sense. The two elements together could perhaps be serving to present a vibe of the positive feelings that one feels as they are about to leave one world and go on to the next. It definitely would be interesting to learn the real story behind this song. Regardless, the positive vibes exhibited through both its musical and lyrical content makes it yet another great example of why Hot Streak proves to be a surprisingly enjoyable recording. It still isn’t the last example of the album’s enjoyment, either. Midway through the album’s run, the band changes gears in dramatic fashion in its presentation of the interestingly titled ‘Fire.’ It is one more example of what makes Hot Streak such a strong return for The Winery Dogs. ‘Oblivion’ and ‘The Bridge’ are both excellent examples of just how much Hot Streak has to offer audiences. While both songs are key examples of the album’s strength in their own right they are not the only examples of that strength. ‘Fire’ is just as important to note in the overall picture of Hot Streak as those songs or any of the others not directly noted. It is so important to note because it is the polar opposite of those songs. The sound presented through its musical content is much more reserved. It would be unfair to call it a ballad per se. But it is still a deeply moving piece regardless in its musical content alone. The song’s lyrical content is just as moving. That is exemplified as Kotzen sings, “We’re struggling with everything/And I don’t understand who we are/Sometimes I wanna run from me and find an end to it in your arms/Running dry/And I feel so numb/I could/But I don’t know what it’s for.” He goes on to sing later in the song, “In this portentous lie that is you and I/How do we secede/I’ve got money on it/It’s all a dream.” As the song progresses past this point it becomes clearer that this song must be rooted in relationship issues. Interestingly enough the song’s musical content doesn’t make it come across as the standard breakup song. Yes, it is reserved in its sound. But it doesn’t have that standard oh-woe-is-me vibe. That in mind, it stands out even more against the rest of the album’s offerings. Together with those songs Hot Streak proves in whole once more to be a record that from start to finish is a welcome return from The Winery Dogs and that is also one of the best of this year’s new rock offerings. Set It Off is heading back on the road again. 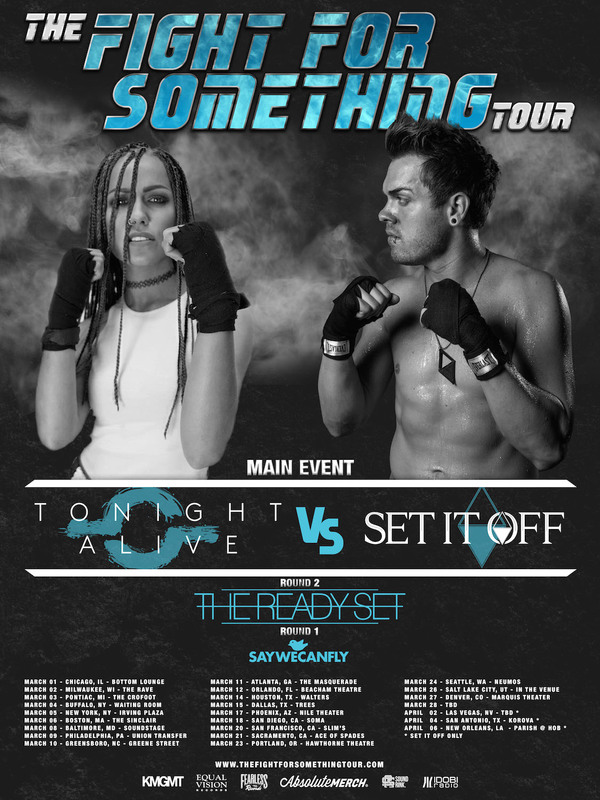 Set It off announced this week that it heading back on tour next Spring. The band will take part in the “Fight For Something Tour” beginning Tuesday, March 1st in Chicago, Illinois. The band will share the stage with co-headliner Tonight Alive and support acts The Ready Set, and SayWeCanFly for the length of the tour. VIP pre-sale begins next Tuesday, November 3rd. General ticket sales begin next Friday, November 6th. After the tour winds down on March 27th, the band will then perform a pair of solo headlining dates on April 4th and 6th in San Antonio, TX and New Orleans, Louisiana respectively. The complete schedule for the “Fight For Something Tour” is noted below. It includes a stop in North Carolina on Thursday, March 10th. 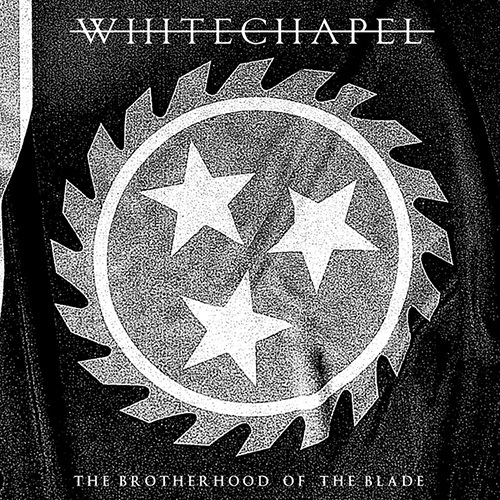 This Friday, veteran death metal act Whitechapel will release its news live recording Brotherhood of the Blade. The CD/DVD combo pack is a rare profile of what is one of today’s most prolific death metal acts. Regardless of audiences’ familiarity with the veteran Knoxville, Tennesse-based band, this recording proves to be one that any death metal fan will enjoy. This applies to the package in whole. For the sake of this review however, the focus will sit on the recording’s audio-only portion (it’s CD presentation). The main way in which Brotherhood of the Blade’s CD proves such an important part of the package is its set list. Over the course of the record’s thirteen-song, fifty-two-minute run time, the featured set list strives to both reach those fans that have been there since the band’s early days and those that have just recently joined the band’s fan base. It mostly represents the band’s most recent full-length recording Our Endless War (2014). However, none of the band’s previous four full-length recordings are ignored here, either. That will be discussed shortly. The band’s stage presence throughout the course of the concert is just as important to note. Front man Phil Bozeman does interact with the audiences at different points. However he and his band mates–Ben Savage (guitar), Zach Householder (guitar), Alex Wade (guitar), Ben Harclerode (drums), and Gabe Crisp (bass)–let the music do the talking here. They attack each song with the full fury for which the band has come to be known for in its live shows. That is evident in the package’s CD side. However, there’s no denying that it translates even better through the package’s DVD side. Both sides together create a concert that audiences listening at home will enjoy just as much as those that were in attendance at the show’s taping. Last but hardly least of note in regards to Brotherhood of the Blade’s CD presentation is its audio mix. Considering the size of the venue in which the concert was recorded the audio mix is quite impressive in its own right. Though, again for full appreciation of that mix fans will want to take in the concert’s DVD presentation as well as its CD presentation. The combination of that solid audio mix alongside the band’s equally solid performance and set list makes Brotherhood of the Blade a live recording that will make any longtime fan proud to be part of the brotherhood and any new fan just as proud to have joined. It is a recording that even by itself proves to be among the best of this year’s new live CD recordings. Whitechapel’s new live CD recording Brotherhood of the Blade is one of the best of this year’s new live CD offerings. It is a CD that over the course of its thirteen tracks and fifty-two minute run time will make any of the band’s longtime fans proud to be part of the band’s brotherhood. It will also leave new fans just as proud to have joined the brotherhood. The main reason for such acclaim is the concert’s set list. While the thirteen-song set list focuses heavily on the band’s most recent full-length studio recording, 2014’s Our Endless War, (it features a total of five songs from that album) it doesn’t ignore the band’s other albums, either. Four of the show’s songs are lifted from the band’s self-titled 2012 album. Two of the featured songs come from the band’s 2006 debut album The Somatic Defilement, and two more are pulled from its followup, 2008’s This is Exile. The only album not represented here was the band’s 2010 album A New Era of Corruption. Considering this, the band is to be commended for having made such a concerted effort to reach its entire fans base. Having left out that one album it would be unfair to call this performance a career-spanning show. But it still does quite the job of showing Whitechapel’s past, present, and potential future, too. It is just one way in which Brotherhood of the Blade’s CD presentation proves to be such a solid recording. The band’s stage presence throughout the course of the concert is also of note here. The set list that is featured over the course of Brotherhood of the Blade’s fifty-two minute run time is, while not career-spanning, is still a healthy representation of the band’s body of work. It is a set list that will entertain the band’s long-time fans just as much as its newer fans. As important as it is to note in regards to the CD presentation’s whole it is just one way in which this presentation proves to be so solid. The band’s stage presence is just as important to the concert’s overall listening experience as the show’s set list. From start to finish, front man Phil Bozeman and company impress with their stage presence. The band lets its music do the talking throughout most of the show. Though, front man Phil Bozeman does take some time here and there to interact with the audience both between songs and even during the songs. There is a certain sincerity in his voice when he thanks the hometown fans for coming out to support the band and for the audience’s years of support. It’s tough to put a finger on it, but that sincerity in his gratitude has just as much effect as his powerhouse vocals as he makes his way through each of the set’s songs. Even when he talks to the audience during the songs, there is a certain confidence in his voice that makes him stand out as a front man even more. It’s one of those things that makes his presence on stage so powerful. Of course his command of the stage isn’t all that makes the band’s stage presence so powerful and noteworthy. Ben Harclerode’s blast beats come across with the precision of an M-16 from one song to the next while the three-guitar approach creates a pummeling wall of sound that as powerful as it is never overpowers Bozeman, Harclerode, or Crisp at any point in the show. Audiences will hear (and see) this for themselves when they purchase Brotherhood of the Blade for themselves. It still isn’t the last way in which the recording proves to be so solid, even as impressive as it is. The audio mix in Brotherhood of the Blade’s CD presentation rounds out the ways in which it shows to be a solid recording. The set list featured in Brotherhood of the Blade’s CD presentation and Whitechapel’s performance of said songs are both key ways in which the recording shows itself to be a solid new live recording from the Knoxville, Tennessee-based death metal band. While both elements are of equal importance to the recording, they are hardly the only ways in which it proves itself worth the listen. The concert featured in both the CD and DVD presentation of Brotherhood of the Blade was recorded at Knoxville’s The International. For those that might not be familiar with the venue, it is a venue with high ceilings but somewhat close walls. That means that sound goes straight out and straight up. It doesn’t have a lot of room in which to spread out and really envelop the hall, basically creating its own share of challenges. This is important to note in the concert’s audio mix because considering this element it would have been easy to have trouble for those behind the boards to balance out the show’s audio. Luckily, those charged with that duty carried out their duties with the utmost expertise. Audiences will be surprised to hear how well each member’s part was balanced against those of his band mates. This is especially important to note considering the sheer power exhibited by the band from start to finish. The end result is a death metal concert that is just as powerful on CD as it must have been in its original recording. That full, pummeling sound couples with the band’s performance of its set list and the set list itself to make Brotherhood of the Blade’s CD presentation one that will make fans new and old alike proud to be part of the band’s brotherhood of fans and a recording that is one of the best of this year’s live CD offerings. Lionsgate studios has never been known as one of Hollywood’s “Power Five” studios. This aside it has still proven to be a powerhouse in its own right. It is the studio responsible for hit movie franchises such as The Hunger Games, The Expendables, and the new thriller Sicario. It is just as well known in the TV world thanks to hit series such as Manhattan, Orange is the New Black, and Mad Men. It has even delved into the world of educational content with its Leap Frog titles. Lionsgate has released a number of titles from Leap Frog in recent years thanks to its partnership with the organization. Those titles include a handful of titles in Leap Frog’s Letter Factory Adventures series. The latest of those titles, The Great Shape Mystery, was released late this summer. And it is yet another enjoyable addition to any early childhood educator’s personal DVD library just as much as it is to the personal collection of any family with a young child or children. The central reason for its enjoyment lies in its story. This time out Leap and company have to set out on a quest a la Indiana Jones in order to figure out the secret of a mystery machine (no, not that mystery machine) that has been delivered to the Letter Factory. The team’s adventure takes it underground through a number of interesting situations requiring some problem solving skills and all the way back to the Letter Factory in the end. And it all happens in the span of about thirty-seven minutes, which is really not that bad. It is just one way in which this latest installment from Leap Frog’s Letter Factory Adventures series proves itself to be so enjoyable. Another way in which it proves itself so enjoyable is its lessons. Despite being part of the Letter Factory Adventures series, this installment branches out into the world of basic math just as with the previously released installment Counting on Lemonade. Even more interesting is that it expertly balances not one or even two lessons but three over the course of that near forty-minute run time. That will be discussed at more length later. Along with its multiple lessons and engaging story, The Great Shape Mystery also boasts another handful of bonuses for kids and grownups alike. Those bonuses include a few sing-a-longs for younger viewers that help to drive home the lessons presented throughout the gang’s adventure and extra curriculum discussions to help parents and educators drive home those lessons, too. Collectively, the bonuses round out the presentation that it The Great Shape Mystery. Together with the featured story and lessons, the DVD in whole proves to be one more great addition to Leap Frog and Lionsgate’s Letter Factory Adventure series. 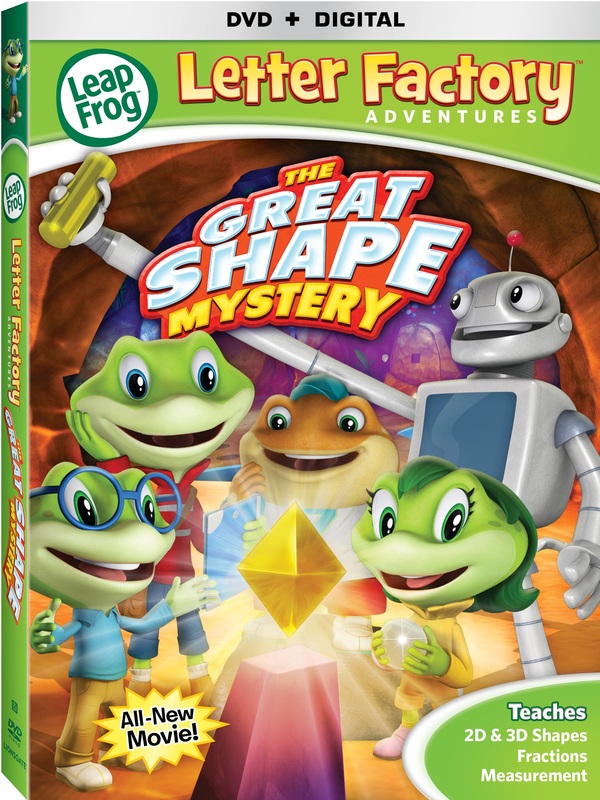 Letter Factory Adventures: The Great Shape Mystery is another great addition to Leap Frog and Lionsgate’s popular Letter Factory Adventures series of DVDs. The main way in which it proves itself so enjoyable is its story. The story follows Leap and the rest of the Letter Factory gang as they set out to solve the mystery of a new machine that has been delivered to the letter factory. The adventure takes the gang underground and through a number of interesting situations that require some problem solving skills. Just as with previous Letter Factory Adventures DVDs the story presented here is family friendly. And it has been scripted in such fashion that not once does it ever go over the heads of its target pre-school-age audiences. In other words, the story and its incorporated lessons are written at the target audiences’ level, thus keeping those viewers engaged. Just as important to note of the story is its run time and associated pacing. The presentation in whole runs roughly thirty-seven minutes. Thirty-seven minutes may seem like a lot even for a pre-schooler. But the pacing of the story over that time is such that those audiences will in fact remain engaged. The pacing together with the run time and story itself combine to make this central element of the presentation a key way in which The Great Shape Mystery shows itself to be yet another enjoyable installment of the Letter Factory Adventures series. It is just one of the ways in which this DVD shows itself to be so enjoyable, too. The lessons that are featured within the story are collectively another way in which it shows itself to be so impressive. The story at the center of The Great Shape Mystery, its run time and associated pacing are hugely important elements to note in examining what makes this presentation so enjoyable. And as important as they are to the whole of the DVD’s overall presentation they are only part of the presentation’s whole. The lessons that are incorporated into the story are just as important as the story and its associated elements. The story features a total of three lessons over the course of its nearly forty-minute run time. The lessons are each centered on basic math skills. They center on basic geometry, measurements, and fractions. It’s not the first time that one of Leap Frog’s Letter Factory Adventures DVDs has featured basic math lessons. But the fact that the series is titled Letter Factory Adventures yet features basic math lessons shows the thought put into the DVD. It shows once more that those behind the series understand the need for the series to branch out in order to be successful. What’s more, the lessons are presented such that they are easy for those target viewers to understand. Leap and his friends don’t use big words, formulas or any related matters in teaching the lessons. They are presented with terms that those young viewers will understand and in turn connect with easier. Even more noteworthy of the lessons is the manner in which they are delivered throughout the course of the program. The lessons are actually made part of the story instead of being the center of focus. They are also very well-balanced from beginning to end. No one lesson gets more time than the others. This ensures even more that young viewers will not only remain engaged but will also easily grasp the presented concepts and retain them, too. It is yet another way in which this DVD shows itself to be an important and enjoyable addition to the Letter Factory Adventures DVD series. The story at the center of The Great Shape Mystery, its associated elements, and the lessons tied into the story are each vitally important to the presentation’s overall viewing experience. While both elements are equally important to the whole of the program, they are not all that deem noting in considering the DVD’s overall presentation. The bonus material included alongside the main feature rounds out the DVD’s presentation. Just as with previous installments of Lionsgate and Leap Frog’s Letter Factory Adventures, this one has also come complete with a handful of bonus sing-a-longs for kids and curriculum material for parents and teachers. The sing-a-longs are not just sing-a-longs, either. They are songs lifted directly from the main feature. Each one serves to drive home even more the lessons presented throughout the course of the main feature. And being that the program is aimed largely at pre-K-aged children, said viewers likely won’t even realize that they are being educated while also being entertained at the same time. This is nothing new to the Letter Factory Adventures DVDs and is just as welcome here as in those aforementioned DVDs. The case is similar with the bonus curriculum material included for parents and educators. Instead of forcing both parties to sit through the entire presentation a second time, only the first few minutes of the program are used in order to establish the key lessons and lesson ideas. In other words, the bonus curriculum material is presented in a quick yet clear and concise fashion. It’s exactly the same as with each previous Letter Factory Adventures DVD. So regardless of whether they are used in a home setting or in the classroom, the bonus curriculum materials and sing-a-longs both prove quite useful in the end. Those bonuses set alongside the DVD’s story, its associated elements, and its lessons leave no mystery about The Great Shape Mystery. It is yet another great DVD for any Pre-K educator and for any family with young children. They collectively make The Great Shape Mystery yet another great addition to Lionsgate and Leap Frog’s Letter Factory Adventures series. 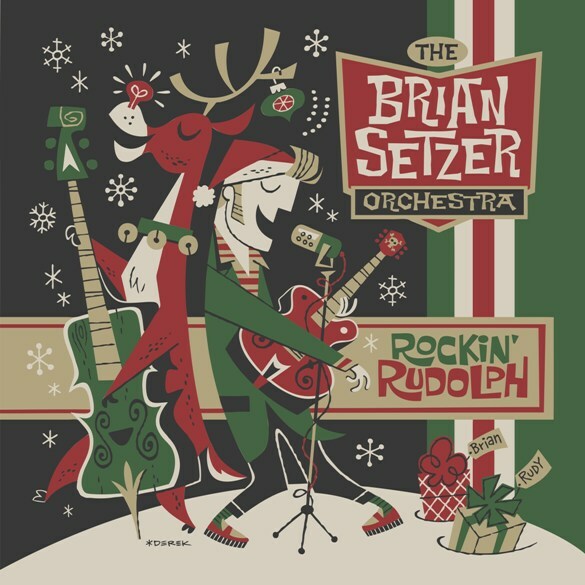 Ten years have passed since Brian Setzer and his feow musicians in The Brian Setzer Orchestra released their last holiday album. Now with Halloween only days away at the time of this posting and Christmas still well over a month away, Setzer and company have brought audiences an early present for all of the group’s fans. The present comes in the form of its new album Rockin’ Rudolph. Being the group’s first Christmas album in a decade it is a welcome return. Given, there is no original material presented in this record per se. However, the group’s upbeat renditions of the featured holiday standards are within themselves plenty of reason to have this record echoing through any family’s house this holiday season. This is obvious right from the album’s opener, the big band rendition of ‘Rockin’ Around The Christmas Tree.’ The song boasts the group’s trademark swing and also keeps the song’s original feel at the same time. ‘Rockabilly Rudolph’ is more proof of what makes BSO’s new holiday such a welcome return. It is anything but the original song. Rather, Setzer and company have taken the classic tune and completely re-imagined it. One could even say that they turned it on its ear. The band’s updated take on ‘O Little Town Of Bethlehem’ is just as intriguing. That is because Setzer and company have also re-imagined this holiday standard in its own unexpected fashion. All three songs are in themselves clear examples of why Rockin’ Rudolph is such a welcome return. Together with the collection’s other nine covers the collection in whole proves to be quite the surprisingly enjoyable musical holiday treat. The Brian Setzer Orchestra has brought audiences quite a surprisingly enjoyable musical holiday treat in Rockin’ Rudolph. The twelve-track, thirty-four minute collection of holiday standards is such a welcome return for Setzer and company because unlike so many other well-known mainstream acts out there, Setzer and his fellow musicians don’t just perform the standards and call it a day. Instead, they take the noted standards and build on them at some points while totally re-imagining them at others. The end result is a record that any family will want echoing through their homes this holiday season. This is obvious right from the album’s opener ‘Rockin’ Around The Christmas Tree.’ Setzer and his band mates have taken the original standard here and given it a full-on big band swing touch that also features Setzer’s own rockabilly style on guitar. The album’s liner notes don’t specifically note who handled the drums on this song (apparently there were two drummers utilized in recording the featured songs). Regardless, the drums absolutely swing and will have listeners dancing in their kitchens and living rooms as they bake those christmas cookies and drink their eggnog. The same can be said of the band’s horns. They swing just as much as the group’s drummer. The horns and drums set alongside Setzer’s own trademark rockabilly style sound make this cover one that stands head and shoulders above all of its other renditions across the musical universe. It is just one example of what makes this record such a solid collection of holiday covers, too. The band’s updated take on ‘Rudolph The Red-Nosed Reindeer,’ titled here ‘Rockabilly Rudolph’ is another example of everything right with this record. The big band swing of ‘Rockin’ Around The Christmas Tree’ presented by the members of BSO makes the song a great first impression from Setzer and company in its first new holiday record in a decade. It shows that Setzer and his fellow musicians offer audiences more than just the standard holiday covers. And it does so quite convincingly, too. ‘Rockabilly Rudolph,’ the band’s take on ‘Rudolph The Red-Nosed Reindeer’ is just as enjoyable for audiences. That is because it is yet another piece in which Setzer and his fellow musicians do more than just cover the old standard. Instead, they completely turn the song on its ear with a rockabilly take on the classic. It goes without saying that this rendition of ‘Rudolph The Red-Nosed’ sounds almost nothing like the original. And that is not a bad thing, either. There’s even a tribute to James Bond with the famous spy’s theme song incorporated into the song. Setzer is the main star of this piece. Though, his band mates shine just as much. All things considered here, this original take on the holiday standard is something that audiences won’t hear anywhere else. It proves even more why Rockin’ Rudolph is such a standout holiday offering and an equally impressive return for Setzer and his fellow musicians to the realm of holiday music. It is of course still not the only example of what makes this record so surprisingly enjoyable. The group’s take on ‘O Little Town Of Bethlehem’ is just as interesting to hear. BSO’s cover of ‘Rockin’ Around The Christmas Tree’ and ‘Rudolph The Red-Nosed Reindeer’ are both clear examples of why the group’s first holiday album in ten years is such a welcome collection in any family’s home this holiday season. While both songs show in their way just how much this compilation has to offer audiences they are only a couple of examples of just how much the record offers. The group’s take on ‘O Little Town Of Bethlehem’ is one more example of just how much this record sets itself apart from all of the year’s other holiday music offerings. As most audiences know, ‘O Little Town Of Bethlehem’ is quite the solemn piece’ in its original presentation. In the case of BSO’s rendition, the band has replaced that much more solemn feel with something more along the lines of a slow jazz sound. It’s quite the departure from the far more reserved sound to which audiences are accustomed. That’s not to say that it is a bad thing. Rather it is just a something different. The very fact that Setzer and his band mates have opted to go a different route just as much here as with the record’s other covers makes the record in whole all the more interesting. Speaking of those songs, the collection in whole is so original in regards to its renditions that audiences will agree in hearing it that it is in fact quite the surprisingly enjoyable musical holiday treat for any family. A little more than four decades ago, a little band named Lynyrd Skynyrd released its debut album (Pronounced Leh-nerd Skin-nerd). At the time of its release, no one would have known that said album would go on to become one of the band’s biggest and most beloved. Surprise, surprise. That album has long since gone platinum at least twice over if not more, and has produced some of the band’s biggest hits of all time including: ‘Tuesday’s Gone,’ ‘Gimme Three Steps,’ ‘Simple Man,’ and perhaps its biggest hit of all ‘Freebird.’ With the quick success that that album saw, the band followed it up the very next year in 1974 with the release of Second Helping. That album proved to be just as successful if not more so. Earlier this year, the current Lynyrd Skynyrd lineup celebrated the ongoing success of both albums when it performed both albums in their entirety over the course of two nights at the Florida Theatre in Jacksonville, Florida. Now thanks to the people at Eagle Rock Entertainment, audiences can see both performances in one package in the band’s new live recording Pronounced Leh-nerd Skin nerd & Second Helping Live From Jacksonville at the Florida Theatre. There is a lot for audiences to appreciate about this presentation beginning with the noted two-album set list. It’s just one part of what makes te recording so impressive. The band’s stage presence throughout both sets is just as important as the complete album set lists. Last but hardly least of note is the shows’ production values. Considering the venue’s high ceilings and open space, balancing acoustics was obviously quite the task. But both the band’s production crew and those behind the mics did a superb job of balancing the concerts’ levels from start to finish. The camera work is just as impressive with shots from multiple angles, capturing the theater’s surprising size. The shows’ variety of shots and their equally impressive audio mixes partner with the band’s stage presence and the shows’ complete album set lists to make Pronounced Leh-nerd Skin nerd & Second Helping Live From Jacksonville at the Florida Theatre a show that every Lynyrd Skynyrd fan will want to have in his or her own home DVD/Blu-ray library and Lynyrd Skynyrd collection. 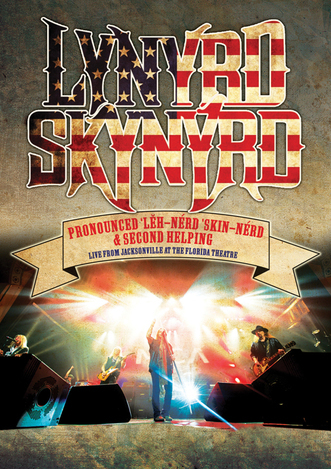 Lynyrd Skynyrd’s brand new live recording Pronounced Leh-nerd Skin nerd & Second Helping Live From Jacksonville at the Florida Theatre is one that every Lynyrd Skynyrd fan will want to have in his or her own home DVD/Blu-ray library and Lynyrd Skynyrd collection. The main reason for this is its sixteen song set list. The set list in question comes from the band’s 1973 debut album (Pronounced Leh-nerd Skin-nerd) and its followup, 1974’s Second Helping. Both albums are presented in their entirety over the course of a two-night stint at the Florida Theatre in the band’s hometown of Jacksonville, Florida. This means that not only are all of the album’s major hits there, so are the lesser known yet still enjoyable songs such as ‘Mississippi Kid,’ ‘Poison Whiskey,’ ‘The Needle and the Spoon’ and ‘I Need You.’ Front man Johnny Van Zant even points out ahead of ‘I Need You’ that the band very rarely performs that song in a live setting. That makes its inclusion in this performance all the more special. It is a truly touching work, too; one that will move any viewer regardless of his or her familiarity with the song. It is more proof–along with the inclusion of the other lesser known songs–why this live two night recording is so special and why the “hits” are not always the only hits. Just because a record label says “X” or “Y” song is a hit doesn’t mean that fans will agree. On another level, the presentation of both albums in whole gives audiences of all ages a much richer picture of Lynyrd Skynnyrd in more than one way. The performance of both albums presents a full picture of Lynyrd Skynyrd’s original lineup creatively. The performance of those albums by the band’s current lineup is almost a side-by-side portrait in a manner of speaking. It’s like experiencing the “old” Lynyrd Skynyrd and the current Lynyrd Skynyrd all at the same time for lack of better wording. All things considered here, the dual set list that makes up the body of the recording shows in full why it is such an important part of the recording’s whole. it is just one part of what makes Pronounced Leh-nerd Skin nerd & Second Helping Live From Jacksonville at the Florida Theatre such a proud success. The band’s stage presence over the course of both nights’ sets adds even more enjoyment to the recording. The dual album set list that makes up the body of Lynyrd Skynyrd’s new live recording is in itself plenty of reason for fans to add it to their home DVD/Blu-ray libraries and Lynyrd Skynyrd collections. It is just one part of the recording’s whole that makes it so impressive. The band’s stage presence adds even more enjoyment to the concert in whole. That is because the band shows throughout both performances that the k.i.s.s. formula still works perfectly to this day. There was no need for on-stage antics, pyro or anything else. The band let the music do the talking. And it talked loud and clear, too. The energy exhibited by the band in each night’s set proves that. It showed that the band wasn’t just phoning it in at any point. Rather, it showed that the band intended to give its audiences the best show that it possibly could on both nights. Even when Van Zant did take some time between songs to interact with the audience, he didn’t just say a couple of things and go into the next song. He really interacted with the audience and made them feel that they were part of the show. As minor of an element as it may seem to be, it is just as important as the songs themselves. Together with the band’s overall stage presence and the set lists, both the set lists and the band’s presence together make for even more enjoyment for fans throughout the band’s shows. Even with their importance they are still not all that make this pair of performances so impressive. The concerts’ production values are just as important as the set lists and the band’s performance of said set lists. The set lists that make up the body of Pronounced Leh-nerd Skin nerd & Second Helping Live From Jacksonville at the Florida Theatre, when combined with the band’s performance of both set lists makes for plenty of enjoyment throughout the course of the recording. While both elements are of equal importance to the overall viewing experience here, they are not the only important elements worth noting. The shows’ overall production values are just as important to note as anything else. Without proper production values none of the recorded material would be worth the watch. Luckily for fans the production values incorporated into this concert are of the highest caliber. Of course that is to be expected from Eagle Rock Entertainment being that the label is the leader in live recordings. Those that have never been inside the Florida Theatre will be surprised to see the concert hall’s immensity. This critic is among those masses. Its ceilings come across as being quite high. And the overall space feels just as open. This means that sound will spread out everywhere. It also means more space for echoing. That can be a very bad thing when recording an indoor performance. Those that handled the mics and the boards for the shows’ original recordings did so with the utmost expertise. Thanks to their work audiences really get the full feel of the theatre’s size without getting any of the echoing, feedback or other issues. It shows the talents of those charged with handling the concerts’ audio and makes those individuals all the more deserving of praise. The same can be said of those behind the cameras. The venue being so large and open, the camera crew was given plenty of options for camera shots. And they used every one of those options, too providing audiences at home not only great footage of the band’s performance but of the theatre and the audience in attendance. Those shots include shots from the theatre’s upper balcony, looking up at said balcony from the stage, looking at the stage from amidst the audience and so much more. In whole the work of those behind the cameras gives audiences the best seat in the house and the fullest experience. It rounds out the ways in which Pronounced Leh-nerd Skin nerd & Second Helping Live From Jacksonville at the Florida Theatre proves itself such an impressive experience for any Lynyrd Skynyrd fan and shows once more why Eagle Rock Entertainment remains once more the leading name in live recordings. Before the 2015 – 2016 NFL season kicked off, very few of the major talking heads out there had much faith in the Carolina Panthers. Many felt that the Panthers would even come close to the playoffs. Now almost halfway through the regular season, Carolina sits undefeated at 6 – 0. Now next Monday, Cam Newton and company will look to stay undefeated as they go under the lights to take on Andrew Luck and the AFC South-leading Indianapolis Colts. Next Monday night, ESPN’s Monday Night Football will broadcast live from Bank of America Stadium in Charlotte as Cam Newton and the Carolina Panthers host Andrew Luck and the Indianapolis Colts. The 3 – 4 Colts lead the AFC South and have gone 3-2 in their last five games while the Panthers have not yet been taken down. It is one of five teams that currently sit undefeated this far into the season. This means that it will have plenty to play for Monday Night when the Colts come into Charlotte. Mike Tirico and Jon Gruden will be in the booth for the call. Lisa Salters will also be on hand for additional commentary and news throughout the game. To keep up with the latest sports and entertainment news and reviews, go online to http://www.facebook.com/philspicks and “Like” it. Fans can always keep up with the latest sports and entertainment news and headlines in the Phil’s Picks blog at https://philspicks.wordpress.com.